Blogtober Day 3 - Our First Date | GirlsGospel.com - OUR FIRST DATE! Hubby and I have been together for over 10 years now. We’ve had plenty of ups and plenty of downs during that time, but we’ve remained steadfast in our union. (He’d probably tell you he couldn’t get rid of me if he tried)! It’s definitely true in our case that opposites attract. When we got together, I was 24 and definitely a live for the moment kind of girl. I worked hard so I could play hard. My money went on the weekend, holidays and clothes. Nothing was put aside for a rainy day, and I was still living at home. He was 29, owned his own home, worked hard, and played very little. We met up for our first date at a local nature reserve and he assured me I wouldn’t need wellies. He was an hour late, and I was just about ready to leave, when he turned up. He was very apologetic – the queue to the car wash was really long, and once he joined he couldn’t get out of it. (That’s what he says anyway – I think he was probably just assuming I’d be an hour late like women often are). We set off for our walk, and it was like a swamp. We both ended up filthy. I’ve never been so glad I wore flat shoes in my life! He seemed genuinely mortified. As first dates go, it wasn’t going particularly well. He earned some serious brownie points when he bought us both huge hot chocolates at the cafe. It was a cold January day, so after the hour sat in my car and the chilly walk, it was like a mug of heaven! After our first date, I thought he was trying to give me the brush off, as he got a bug the following weekend and was sick for well over a week. (Turns our he had a really bad case of food poisoning). I went to his house for our 2nd date, and I don’t think I really left much after that. I’d spend some nights at home when I was working, but I was at his house more often than not. By September, I’d officially moved in, quit my job and started working for him. I finally felt like a grown up. Weekends didn’t involve going out partying as much, but that was ok. I enjoyed being at home just as much – if not more. That’s not changed much over the past decade to be honest. We’ve got married, had 2 babies and survived both baby loss and the loss of my mum. We are definitely a team. How did your first date go? Was it a “sweep you off your feet” affair? Or more of, “A series of unfortunate events”, like ours? Feel free to share it in the comments! 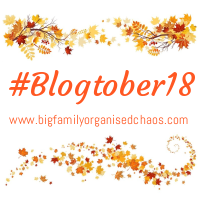 The idea behind Blogtober is: You write a blog post each day, based on that day’s prompt. You can view the full list of prompts in my Day 1 post. hehehe! Your first date did make me chuckle. What a cute story.